With Black Friday almost upon us I thought I’d put a little post up about a few deals some of you local metal heads might find interesting. I’m not a big fan of corporate consumerism and waiting in line at box stores, more power to you if that’s your thing but it’s not for me. This post will try to focus more on local and mail order stuff from places not quite as famous as those mega chain stores but who probably deserve your money even more. This is by no means a comprehensive list so feel free to add more in the comments section. First up is Record Store Day which decided to have a second date this year that they’re calling Back To Black Friday (the regular RCD was back in April). 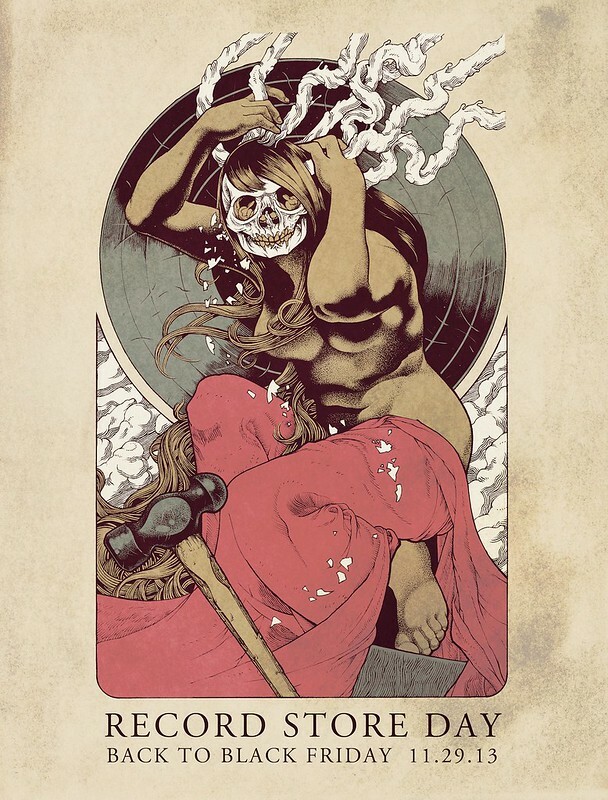 That means most of the area’s local record stores (and stores around the country) will have exclusive items for sale this Friday, including a sick looking poster by John Baizley of Baroness (see it here). The Vienna Music Exchange and Shockwave Records will both be participating, though Black Mess will be closed all weekend. There will be exclusive releases by Metallica, Life Of Agony, Puscifer, Rush and more, the full list is located here. 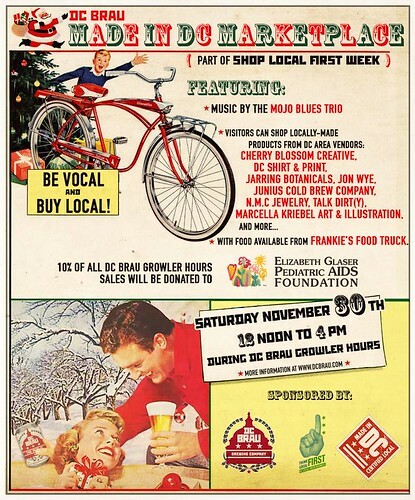 If you want to do some holiday shopping/browsing while you’re drinking some excellent beer then I highly recommend you swing by the DC Brau brewery this Saturday from noon to 4pm for the Made In DC Holiday Marketplace. The market will feature booths from artisans and businesses that are all from Washington DC. Even better, you’ll be able to sample various DC Brau beers for free while you’re there! The address of the brewery is 3178 Bladensburg Rd NE, Washington, DC 20018 (map). You can find more info on the Facebook event page here. Don’t think I’ve forgotten about those of you who don’t even want to leave the house on Black Friday, I’ve got some great deals for you and even a few give aways you can enter in to win. I’m not above whoring my own site out so be sure to check out our free Megadeth/Fear Factory ticket give away here and enter to win to see these bands play on 12/4 at the Fillmore Silver Spring. The winner will be chosen at 5pm on Black Friday so be sure to enter before then. 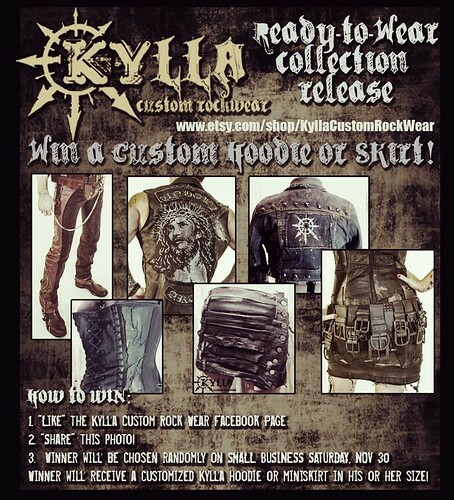 Another contest that you can enter in absolutely for free is from Kylla Custom Rock Wear. This Virginia based company makes custom clothing for bands (and fans!) at reasonable prices and you’ve probably seen bands wearing their gear at concerts including Kreator, Children Of Bodom, Watain, Death Angel and they even made a camera bag for me (it rules). They just opened their Etsy shop (here) and you can check out some of their ready to wear stuff right now. On Saturday they’re picking a winner to get a free custom made for you hoodie or miniskirt and you can find out how to enter to win by going here. 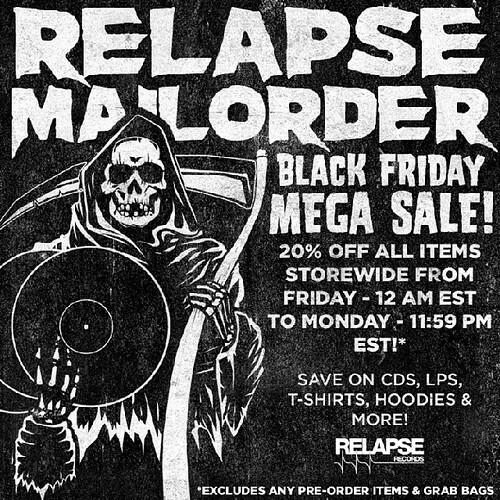 If you’re looking for music and band merch you’ll find a great selection at the Relapse Records online store which will have 20% off everything in their store (except pre-order items and grab bags) from midnight Thursday night/Friday morning to midnight Monday night/Tuesday morning. And don’t think they just have stuff from bands signed to their label, they have stuff from all kinds of metal bands from around the world. Another online site with a great selection will be Indie Merch Store and starting Thursday night/Friday morning at midnight they’ll also be having a Black Friday sale with 20% off everything for the first 24 hours (that’s all day Black Friday) dropping to 15% off everything Saturday and 10% off everything Sunday. They have music and merch from all kinds of metal bands of various genres. You’ll have to use the discount code BLKFRDY13 at checkout to get the discount though. Additionally, Metal Blade Records, whose online store is run by Indie Merch, will have several vinyl releases marked up to 40% off. This includes some great releases by bands like Slayer, Electric Wizard, Amon Amarth and Bolt Thrower. Check out the discounted items here and see if you can get the above Indie Merch Store code to work too, you might get a double sale on these items! 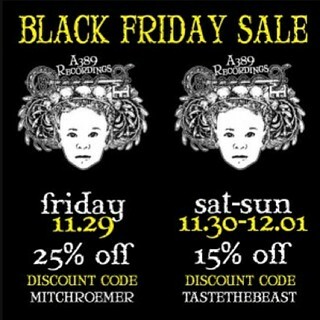 Baltimore based record label and distro A389 Recordings will be giving you 25% off your total purchase (before shipping) all day Black Friday when you use the code MITCHROEMER at check out. On Saturday and Sunday you can use the code TASTETHEBEAST to get 15% off your total (also before shipping). Browse their online store here. 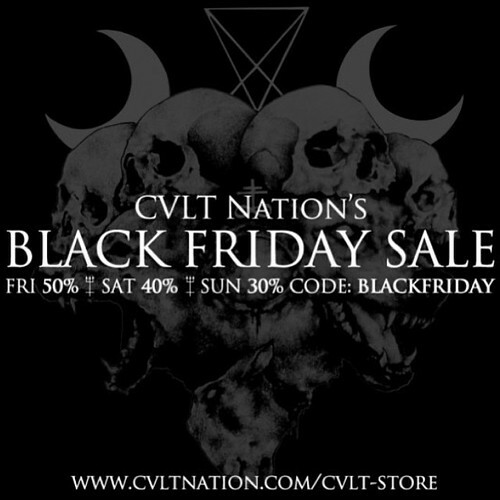 Underground metal webzine Cvlt Nation is giving you 50% off everything in their store on Friday, 40% on Saturday and 30% off on Sunday when you use the code BLACKFRIDAY. Check out their online store here. 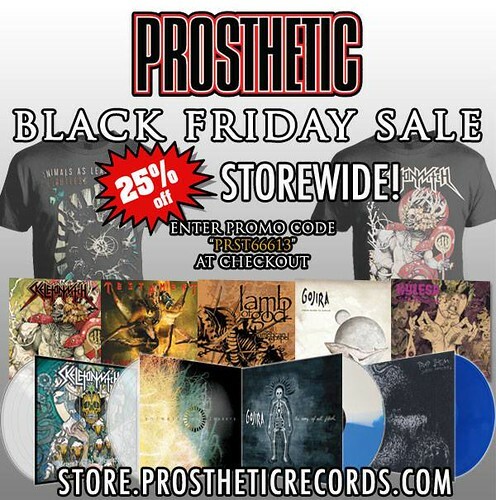 Record label Prosthetic Records is having a sale from Black Friday through Cyber Monday where everything in their online store is 25% off! Just use the code PRST66613 to get the discount at their store, which you can visit here. Brutal record label and distro Horror Pain Gore Death Productions is including a free black metal CD with any purchase on Black Friday of $25 or more. You can check out their online store here. The Omega Order will give you 25% off all vinyl (except new arrivals) all day on Black Friday when you use the promo code FIRE. 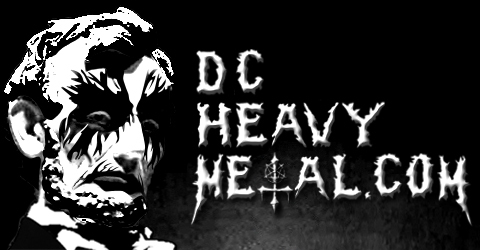 Check out their online metal music catalog here. 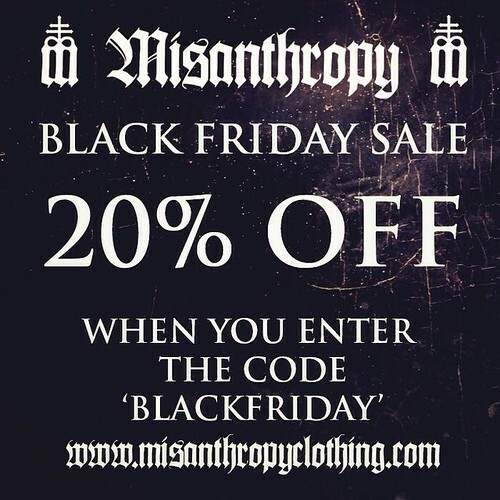 Misanthropy Clothing is giving all orders 20% off when you use the code BLACKFRIDAY at check out. Check out their dark line of clothes online here, I particularly like the Mona Lisa in corpse paint one. 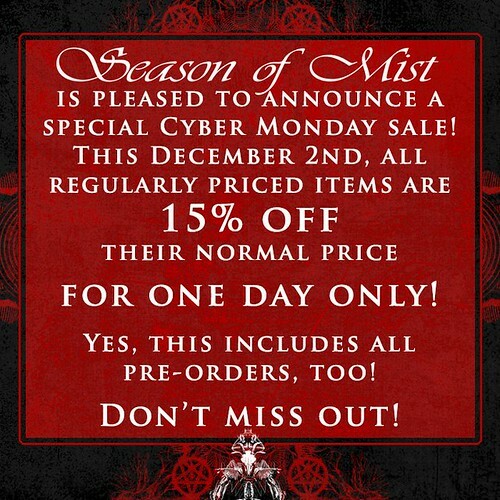 French record label Season Of Mist isn’t doing a Black Friday sale but this coming Monday, aka Cyber Monday, they’ll be marking all regularly priced items 15% off (this even counts for pre-orders). Check out their online store here. Sargent House Productions has a sale from Black Friday through Cyber Monday. You’ll get 15% off all CDs and vinyl and 10% off all other items during this time. They have merch from bands like Boris, Deafheaven, Russian Circles, Red Fang and more. Check out their online store here. 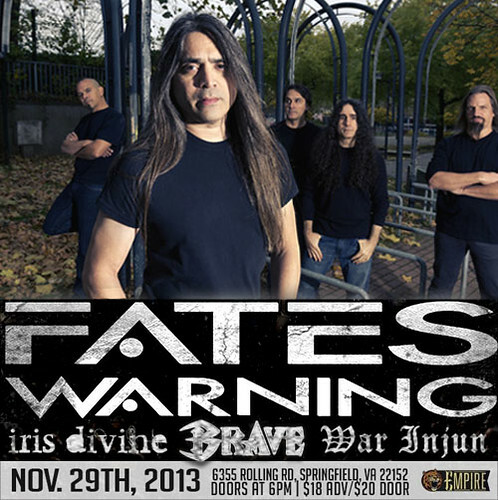 And don’t forget that prog metal pioneers Fates Warning are playing at Empire on Black Friday, along with the excellent local prog band Iris Divine. This show should be a lot of fun so get the details here and come out! 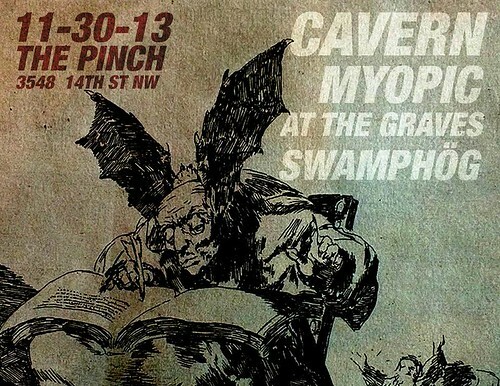 If you’ve spent all your money there’s a free metal show at The Pinch in the Columbia Heights neighborhood of Washington DC this Saturday night. There’s some great bands playing including some proggy shred from Cavern, chilling black metal from Myopic, epic sludge from At The Graves and only the finest in true American pork metal from SwampHög. The venue has some great beer on tap and a full menu too. And yeah the show is free but if you enjoy the bands be sure to donate a few bucks or buy some merch, trust me, they’re worth it. Get all the details on this show at the Facebook event page here.